Amsterdam School of the Arts migrated from an early day ScreenCheck Card Management System to the latest generation of CardsOnline. 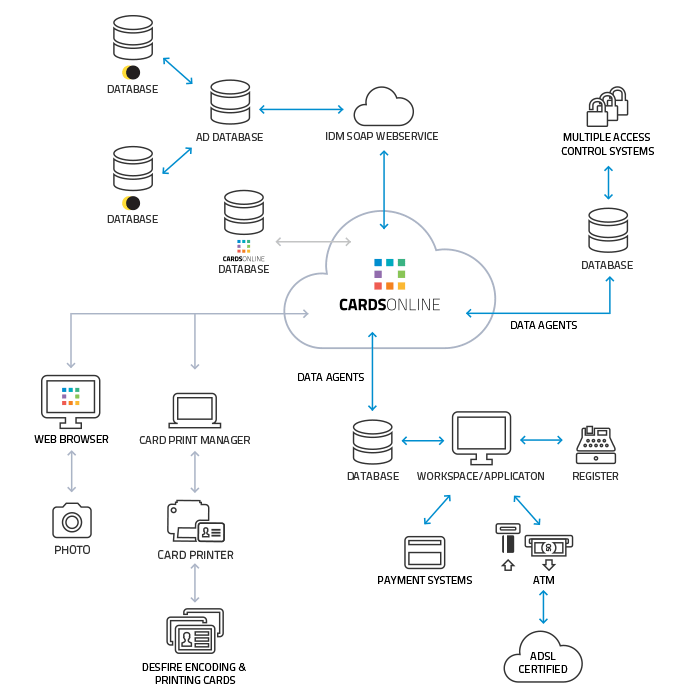 Integrated with their new IDM Identity Management System, Access Control and Cashless Payment Systems, CardsOnline 6.0 creates one central, full integrated system for enrollment, printing/ encoding and issuing multi-purpose student ID smartcards, oﬀering full card control in one system. Implementing the new IDM Identity Management System, Amsterdam School of Arts required a new Card Management System (CMS) connecting to the Student- and Employee administration systems (source systems). Amsterdam School of the Arts speciﬁed the new Card Management System to use web services, for seemless integration with various systems, providing a single application to manage all card related activities. The Card Management System should enable easy enrollment, printing/encoding and issuing the cards realizing a real one-card-solution for production and managing the ID card. With the implementation of the new Card Management System, Amsterdam School of the Arts planned to change from a OneYear- to a Multiple-Year card. ScreenCheck oﬀered a local CardsOnline implementation with a webservice interface connection to the IDM of Amsterdam School of the Arts for importing persons data and exporting trigger based card status changes. ScreenCheck integrated a new Card Printer SC7000 with laminator to apply a high wear resistant laminate protecting the Multiple-Year cards. Data exchange between various sytems (Student Information, Closed Site Payment and Access Control) and CardsOnline is handled by data agents (webservices/cronjobs etc). The Service Portal by CardsOnline provides a unique feature to send an email request/notification noting students to login to their Service Portal account and remotely capture or upload a picture and edit their information. No longer requiring taking pictures on-site. access to the school and related buildings such as the Library and make payments for Catering and Follow-me Printing & Copying.